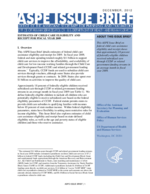 Within the federal eligibility parameters of CCDF, states have flexibility in setting income eligibility guidelines, parental co-payment fees, reimbursement rates to child care providers, target populations receiving priority for services, the number of work or education/training hours required, and the length of certification periods.8 Based on state-defined eligibility rules for fiscal year 2009, the average initial income eligibility limits for three person families across the 50 states and the District of Columbia was $2,800.9 Some states allow counties and other localities to set income eligibility limits lower than the limit set by the state. Some states also allow higher income eligibility limits for families already receiving child care subsidies. Figure 5 shows the extent to which children eligible for child care subsidies based on federal parameters were eligible under the rules defined by their state of residence. Almost 2 out of 3 (64 percent) of federally-eligible children were eligible for subsidies under state-defined rules. Almost all federally-eligible children from families with incomes less than 100 percent of poverty were eligible under state-defined eligibility rules. By comparison, about a third (34 percent) of federally-eligible children from families with incomes greater than 150 percent of poverty were eligible for services in their state. This Figure11 shows only the percentage of children eligible for subsidies based on federal parameters that also were eligible under state rules and does not indicate rates of participation. Approximately 28 percent of all children eligible under state-defined rules received subsidized care through CCDF or related government funding streams in fiscal year 2009 (see Figures 6a and 6b). As was the case when considering federally-eligible children, children eligible for assistance under state-defined rules who were between the ages of 1 and 4 (43 percent of children ages 1-2 and 45 percent of children ages 3-4) or from families with incomes below poverty (39 percent of all eligible children from families with incomes below 100 percent of poverty) were the most likely to be served.